Even though we all started to rouse at around the same time this morning, it was a slow start to the day. The rainfall over the past 24 hours had made for a rather sticky and humid environment. Sandy and me are often at odds when it comes to air conditioning in whatever accommodation we happen to find ourselves. I find it difficult to tolerate the humidity without the A/C and Sandy absolutely loathes the moving air and noise. I did my best to find a couple of slots during the night where I thought she would be in a deep enough sleep for the A/C to not bother her but she awoke this morning complaining of having had very little sleep all the same. ￼I thought I’d crack out the free 2-hours Internet voucher that we had obtained from the duty manager last night. Unfortunately, it had by now expired and so I had to wander up to reception to explain the whole thing again to the new duty manager in the hope of scoring a fresh voucher. Fortunately, the new duty manager was very accommodating woman and had no problem issuing me a new 2-hour voucher again. With that, I was able to upload another day’s worth of journal entries and Sandy was finally able to get her Facebook album populated with all the good photos we’ve taken so far. Sandy was pottering about packing some bits and bobs for today’s river safari and so I got the kids dressed and we were soon off to breakfast again. As we were all tucking into breakfast, the trio of musicians that were sitting in the corner playing soothing and gentle Fijian style music, my mind wandered back to the preceding week and just how much I’ve truly enjoyed myself here. Although we’ve been here but a few days, I’ve enjoyed every one of those days and have really taken to the Fijian staff, who have bent over backwards to accommodate us and have just generally been friendly and warm to us throughout. I felt quite saddened at the prospect of having to leave tomorrow. It must have been the last day for the people on the table next to us, because the three musicians and several other staff came to their table to sing them the Fijian goodbye song, Isa Lei. It’s now a familiar song to us, having heard and seen this display a few times now. It’s such a gentle and pleasing little lullaby and I’ve found it to have a tendency to invoke very strong emotions in me for some reason. Perhaps it was again the sleep deprivation but I felt myself welling up uncontrollably as I listened to the song and found that, much as I tried, I simply couldn’t hold back the emotion any longer and just burst into tears of mixed happiness and sadness. What a big softy I’ve turned into, I confessed to Sandy, as she too was overcome and we had to embrace to hide our vulnerable embarrassment. ￼One of the waiters then asked me if this was our last day but I had to tell him that we would be here for one more day yet. I did mention to the man at the front desk of the Sundowners restaurant a couple of nights ago when I booked for tonight’s meal there that it would be our last night and meal before leaving tomorrow and he smiled and wrote something next to our booking at the time, so I’m half expecting to be serenaded tonight as we dine. We’ll see. As we ate this morning, there must have been half a dozen different serenades to people for whom today must have been their last day. It’s a really nice touch and will for many people, I’m sure, make the whole stay a very much more memorable and special one. As we finished up eating our morning fill, we repeated yesterday’s tactic of asking for a couple of take-away boxes to stash some pancakes for the kids for lunch - just in case the lunch that would be laid on for us in the Fijian village was not to ours (or the kids’) liking. I filled one box with pancakes and the other with fresh cut fruit from the fresh fruit bar. We’ll take some bottled water and juices with as and so we should be all set for a lovely afternoon. The kids met up with some of their kids club friends and we all wandered over to kids club to drop them all off. We’ve been resting here back at the bure now for the past hour or so. My 2-hour Internet voucher expired and I bit the bullet and spent another $8 Fijian Dollars on a new 1-hour session, which has now also expired. ￼As we’ve been sitting here, the maid came to turn down our beds and empty the bins and such. She’s a lovely and warm Fijian woman, as are they all, and she shook our hands warmly as she thanked us sincerely for staying here at the Outrigger. Nice. One of the other guests that had already been on a river safari mentioned that it would be a good idea to take along some notepads, books, pens, etc. as gifts for the kids. Educational items such as this are much better offerings to the locals (local kids, that is) than is money, in my opinion, which I’ve learned through our previous travels can actually have a more destructive than constructive effect on local life. A child that is offered money, what for them might very well be a very large sum of money, but what for the tourist would probably not be, will quickly learn that begging for money is a much more lucrative way of life, at least in the short term, than is staying in school and getting and education or learning a trade to set them up for life. This can easily create a short-term cycle of dependency that can be hard to break free from. Once children have learned this behaviour, further trouble can develop if and when the tourism dies down at some future point also. Giving money to smaller children could also lead to them being bullied for this money by bigger children out of shot also. Fortunately, Sandy had packed various colouring books and felt tip pens for our kids which have not been used so we will be taking these for the children there. ￼I have to admit to just a little bit of apprehension as to whether this comes across as arrogant or inappropriate in any way. We’ll find out one way or another in a couple of hours. We decided that Sandy would collect the kids and I would take our bags with cameras and a change of clothes up to main reception to wait for our transfer for our Sigatoga River Cruise excursion. I waited and waited but with just 5 minutes before departure, Sandy and the kids still hadn’t arrived so I walked briskly back to the bure to see what the hold up was. Both kids had apparently somehow managed to get soaking wet feet and needed a change of both socks and shoes but Sandy’s keycard was not working. I had earlier this week locked both our original keycards in the room and obtained a couple of new ones to replace them. It seems that the original keycards were disabled when we did this and Sandy must have still been carrying one of the original ones. To make matters worse, Joey had apparently had a bit of a meltdown and stress levels were soaring. I sent Sandy and the kids to reception whilst I organised a change of shoes and socks for the kids. When I made it to reception, our bus was just arriving. With no time left to go back to the bure, I left Joey’s wet shoes with one of the tour desk staff members as we boarded the bus. ￼The bus seated about 20 people and was about two thirds full. It was a short, 10-minute ride into town, where we were invited to get out and spend a few minutes shopping with a 10% discount at this one particular store, where I also had to sign a waiver form for the trip. I was actually quite put out by this. There was never a mention of a waiver form when the tour desk took my money. To make matters worse, the waive was really quite toxic and completely one-sided in favour of the operator. I reluctantly signed it but only after having crossed out whole swathes of it’s contents as I saw fit. I made my feelings clear to the staff member behind the counter and told her that I had crossed a few things out. She didn’t seemed to be bothered by this so that was fine. It was also necessary for all the women in the group to wear a sarong but these were handed out free of charge so that was fine too. By the time I had finished completing the paperwork, we were told that we had to re-board the bus already. This left effectively no time to shop at all. I had wanted, out of sheer principal alone, to not spend a penny in this shop but to explore the town instead. It was a practical certainty that, despite their offer of a 10% discount ‘today only’, that this shop that we were all deliberately sent to was going to be considerably more expensive compared to all the others in town. Alas, there was no time either way and we were soon on our way again. ￼Our bus spent the next half an hour travelling along a relatively new but unhardened and extremely pothole-ridden, lumpy road. During the trip, our tour guide up front was telling us all about Fijian life in general through a microphone and intercom. There were a number of questions posed from various passengers and she did her best to provide detailed answers. I was particularly interested to hear about how Fijian kids were educated and what their daily routines were like. Apparently, this involves getting up between 04:00 & 06:00 every weekday morning to eat and do chores before walking, sometimes several Kilometres, to the river, across which they had to swim with a bucket on their heads. The bucket contained their school uniform, which they would don once safe on the other side of the river. They would then walk the remaining distance to the school for the 08:00 start, where they would remain until 15:00 before returning back to their respective villages again. If only our kids knew just how easy, compared to their Fijian counterparts, they have it here in Australia, being fed and clothed and then taxied in the comfort of a car along smooth and comfortable roads right up to the school gate - only to be collected again for the reverse trip at the end of their school day. Maybe it wouldn’t be so bad for some of our kids to experience Fijian village life for a bit to help put things into perspective for them. The rather bumpy road along which we were travelling was apparently in the process of being constructed under contract by the Chinese, but the tour guide told us that the project was now into the second of three years and the Chinese had started to use local labour. According to the tour guide, this was a ‘big’ mistake, as the road construction was now moving ahead in accordance with ‘Fiji time’, which, it seems, is very much slower than any other type. ￼The tortuous bus ride from hell, with a man at the wheel whom could only ‘loosely’ be describes as a driver, finally terminated at a sort of rural transfer station, where everyone was issued with bulky life jackets before we all boarded our jet boat - after first being thankful to the gods that we’d actually made it here alive to begin with. I had ridden one of these jet boats previously in New Zealand around seven years ago. They go very fast and can skim across the water even when that water is just a few centimetres deep. They can make extremely sudden course corrections and the boat pilots usually make a point of capitalising on this capability by waiting until the very last conceivable minute to avoid obstacles. They can also perform rapid and sudden 360 degree turns pretty much on the spot. All of this tends to make for a very thrilling ride in one of these things and so it promised to be an interesting leg of our journey into the valley. So, with my bunch of Kava root now sticking out of my backpack, we boarded our ride and were whizzing down the river at very high speed in no time. ￼As we meandered along the river, skimming the surface and barely missing numerous trees and other debris in the river, we passed the odd villager here and there along the river embankment. Some were fishing, whilst others were washing or just getting from A to B. Every last person that we saw waved at us cheerily and we all waved back. Indeed, this apparent friendliness hasn’t been confined to the rural villagers but has been a consistency with pretty much all local Fijians that we’ve encountered here. About half way along our route, our pilot stopped and parked the boat at the side of the river whilst he spent around 5 minutes telling us more about village life and what to expect when we got there. I’d say that we were by now a good 5-10 Kilometres up the valley, which was also known as the Fijian Salad Bowl due to the fact that around 70% of Fijian consumed fruit and vegetables are farmed in this valley. With his talk completed, we were soon under way again and our boat was again whizzing away at very high speeds further along the winding river and into the valley. We eventually moored at a spot close to the particular village that we would be visiting today. I can’t remember the exact name, as it had too many unfamiliar syllables, but it translated to something like The Silent Village. Although such boat trips are operated daily, they don’t go to the same village every day. There are apparently 14 villages that benefit from this tourism activity - 7 on either side of the river. They go to a different village every day on a seven day cycle. The same village thus receives a boat full of tourists every week but only for 6 months of the year. After 6 months, they swap to the villages on the other side of the river and thus alternate between the 14 villages over the course of the year. In this way, no one village benefits exclusively from the tourism and those tourism Dollars are equitably split over a wider area. By the time our boat stopped at the river bank at our final destination, pretty much all of us were now sporting fantastically stylish blown back hairdos from the rushing of the wind. ￼Our destination was a nondescript bank along the river, where a plump, round, Fijian woman in a flowery long dress and a flower in her ear was waiting for us already along with another young teenager boy. Our plump new Fijian guide was extremely warm and friendly and she now explained a few things to us about what we should now expect. She explained that the women would need to wear their sarongs and all hats were to be removed as a sign of respect before entering the village. With her briefing lasting only a couple of minutes, we then all started to walk along a dirt track through the jungle towards the village. We walked for about 10 minutes altogether before arriving at a clearing where a rather steep hillside sported a dozen or so rudimentary brick buildings spread out in apparent random order with several meters between them each. I’d estimate that the village in its entirety was certainly less than a football field in size with jungle foliage encroaching around the perimeter and the dirt track along the bottom of the hill marking the village’s boundary. None of the make-shift buildings had anything covering the windows or doors and the roofs looked to be made from corrugated tin. Most of the buildings looked like they were made from white-washed cinder blocks and I saw a couple of washing lines with clothes hanging out on them to dry. There were goats and chickens scurrying about and a wire fence apparently marked the village’s entrance along the side of the dirt track with a small gap in the barbed wire between a couple of posts marking the village’s entrance. We initially saw just a small handful of children dotted about and sparsely clad in ragged clothing. ￼Once it was confirmed that all the women were wearing sarongs and nobody had any hats on, we were all led through the gap in the barbed wire and along a stone path up the hill into the centre of the village. The biggest building in the village was a two story structure consisting of a single main hall, where all the menfolk were apparently sitting already. The second story of this ragged looking structure contained another hall, which apparently doubled up as the village church. Of the four main religions here in Fiji (Christianity, Hinduism, Islam and Rugby), this village was apparently a Christian one. As the remainder of our group finally made it up the steep hill to the main village hall, we all gathered around our Fijian host in a semi-circle and we were told that we would be inducted into the village so that we would be part of their ‘family’. Each time she addressed us, she addressed us as ‘family’. Everyone was then decorated with a leaf & flower ‘lei’ and ‘war paint’ on our cheeks. The practice of using real war paint has actually long since died out and so Johnson & Johnson talcum powder, it seemed, would sufficed for this now. The young teenager apparently had the honours of presenting everyone with their decorative leis and a dab of war paint on each cheek. Being the chief, I was singled out for the honour of being first to be decorated and with a more elaborate lei that the rest of ‘my tribe’. Our host gave us some more interesting information about village life and I was relived of the bound Kava roots that I had been sticking out of my backpack. ￼I was somewhat relieved to be told that one of the local villagers would be my ‘spokesperson’ for the day and so I would not have to worry about saying the correct thing during the Kava drinking ceremony that we were now about to participate in. The hallucinogenic nature of Kava is very well known and our host insisted that we wouldn’t be able to claim to have truly visited a Fijian village without partaking in a drink of Kava. I have to admit that I was just a little bit apprehensive about the whole Kava thing. Unfortunately, as the designated chief of my visiting village, it would be expected that I set the example and so it seemed unavoidable that I would partaking myself. To be honest, I was really getting into the spirit of things and looking forward to it all. With the instructions and explanations now having been completed by our host and everyone now suitably decorated with leis and talcum powder (I mean war paint), we were led into the main hall. The only lighting was the sunlight streaming through the open door and window. The ceiling was high enough to stand, but not much more than that, and the floor was decked with a reed mat. All the village menfolk, some 20-25 altogether I guessed, were sitting on the floor on the far side of the hall, which was only about 6 metres square. Several wooden pillars held up the roof. The village chief was sitting along the wall to my left and was the closest of the men to our group. He didn’t speak - at least not initially. As chief of my village, I was invited to sit in a central position and my tribe came in and were seated in a row either side of me. When we were all seated, the Kava gift from my village was presented and my spokesperson started talking in Fijian. It seemed like a well-rehearsed speech. Then, their chief’s representative started speaking. ￼His similarly well-rehearsed speech was punctuated every now and then with claps and the odd grunt or incantation from all the menfolk - simultaneously and in unison. As this speech was going on, the Kava was being prepared by 3 men sitting opposite me. They were straining the ground powder of the Kava root through a silk scarf with water. It looked like a muddy concoction not unlike the river that we had travelled along to get here. Somehow, I suspected it was going to taste just like the river too. Then, the moment I was most apprehensive about came. The Kava was declared ready and the ceremonial drinking would begin. What looked like half an empty coconut shell was used as a bowl to collect some of the Kava from the large mixing bowl over which the concoction had just been prepared. The two village spokespeople would be first to drink. The etiquette was to clap once, shout Bula, take the bowl and drink the contents down in one go and then clap three times again. After the two spokespeople had their drink, it was my turn and I could sense that all eyes in the hall were on me. Indeed, there was something of an air of anticipatory tension. I was desperate to not offend the chief or any of the villagers by involuntarily gagging or doing something else equally stupid. The bowl was offered, I clapped, shouted Bula and took the bowl and drank the whole thing down in one gulp. There are 4 measures of Kava that you can elect to accept. Teardrop is the smallest measure, then there is small wave, large wave and Tsunami, the biggest measure of all. Naturally, as chief, it was assumed that Tsunami would be my chosen measure. In my eagerness get it right, some of the Kava escaped from either side of my mouth and I was suddenly acutely aware of the camera sitting on my lap that was now probably being drenched in locally brewed Fijian Kava but I kept the ritual going and finished my drink with three claps. ￼This evidently pleased the village as the chief and all the other menfolk clapped and muttered what sounded to me like something of an approval. With this, the tension that had by now really built in the hall seemed to have been pierced and there were some signs of relief (not least from me). The Kava itself didn’t really taste like anything at all really. It felt a little gritty. Within a few minutes, however, the inside of my mouth started to go a bit numb. I half expected that the hallucinogen would shortly kick in and send me into a fit of rampant dancing around the hall. In point of fact, this wouldn’t be that far from the truth, but I’ll get to that. After about 15 minutes or so, the Fijian womenfolk started to prepare lunch for the visiting villagers and we were all invited back into the main hall again to retake our places for lunch. Additional mats were laid out on the main hall floor onto which plastic plates, cups and dishes with Fijian foods were very nicely presented. It all certainly looked very nice. Being a picky eater myself, however, there were only a few different foods that I actually recognised and most of that was food that I wouldn’t have otherwise chosen to have eaten had I been given the choice. However, I was the chief of my village and I was expected to lead by example so I did my level best to take a little of everything with the intention of at least trying a bit of everything. I figured I’d at least make a good show of it by at least having tried, right? It was only then that our host pronounced that it would be disrespectful to take food and not eat it. Oh dear, I thought to myself (it was actually a bit more expletive than that). ￼I did my best to shovel it all down and look like I was enjoying it. As it turned out, It wasn’t anywhere near as bad as I had feared and most of it was actually quite tasty. I managed to only leave the banana peel and a few small bits on my plate. It was explained that it was customary for visitors to eat whilst the locals wait and so we ate whilst listening to more of the men’s vocal music, which I was more than happy about. After the meal was finished and packed away, again courtesy the Fijian women, I was suddenly confronted with what for me would be a true nightmare of epic proportions. Quite unexpectedly, it was announced that the the combined village family would now be expected to engage in some festive dancing. I don’t do dancing. Perhaps it was the Kava that was now kicking in but I think I actually broke out into a cold sweat right there on the spot. As the men’s vocal music started again, we were told that if we were tapped on the hand by one of the Fijian villagers, this would be our sign to get up and start dancing with them. I was bricking it and wondered just whether I might get away with sitting passively in the corner. Alas, no. 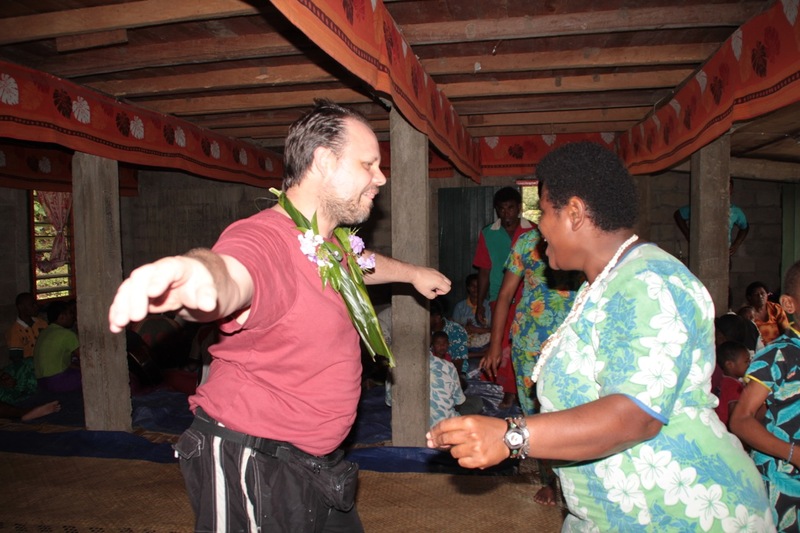 Every last bloody Fijian woman wanted a dance with the bloody visiting chief. Despite my feelings of discomfort and embarrassed self-consciousness, I forced myself up onto the dance floor for every request and did my best to wiggle about a bit trying to at least look like I was dancing. Rather catastrophically, Sandy decided to video the whole shameful spectacle of me attempting to dance and so I will never be allowed to forget the experience for as long as I live. All the while the dancing was ongoing, which seemed like a lifetime, the men were singing and making beautiful music. Not an especially fit, overweight, middle-aged man, I was really quite exhausted after a dozen or so energetic dances and was also sweating profusely. ￼After what seemed like an eternity, the final dance was announced to be the Conga dance, and who else but the chief was selected to lead the procession around the hall. At the completion of that display of future perpetual embarrassment for my children, gloriously recorded for posterity by my woman I might add, the plump Fijian host pulled me aside and told me that both chiefs would now say something to close out the proceedings and thus I had to come up with an impromptu speech on behalf of my village that would befit the situation. Fortunately, I do have somewhat of a flair for words and, after some heavy breathing to collect myself from all the exertion of the preceding dancing, managed a few sentences that seemed to be apt under the circumstances. On behalf of my village, I thanked the chief personally and then the rest of his village for allowing us into their homes and hearts. I said that we had all felt privileged to be here and that the whole experience was very educational and very special and that we would leave as friends with fond memories ... or something similar. At this point, those from our village that chose to do so handed over gifts for the village - which, as it turned out, was mostly money. I think we were the only ones to offer gifts of something other than money - perhaps fitting as I was chief. I handed our host the bag with things for their children and also a $50 Fijian Dollar note. I saw several other $50 notes also being handed over along with some other smaller denomination Fijian tender. Although I wasn’t counting, my best guess would be that the village would have received somewhere between $300-$400 Fijian Dollars altogether from our group - along with our gifts for the village kids. ￼The host later told me that they were hopeful of being able to collect enough money to have their electricity installed by around January of next year, which required that they pay the Fijian government $11,000 Fijian Dollars to string an electricity cable across the river. When I asked her what they would do once the electricity was installed, she said it would be to power a few fluorescent bulbs for the benefit of their children having the opportunity to study & learn. The hope was that this might avail the children of the availability of a better life of something other than the hard toil of farming. She also said that nobody in the village would be able to afford the electricity for anything else anyway - nor would they be able to afford the purchase of any other electrical devices. Our time at the village was finally drawn to a conclusion with all the Fijian villagers singing their visitors Isa Lei, the Fijian goodbye song. It was very sweet and I felt a genuine privilege to have been a part of the experience. It wasn’t the tacky, watered down, touristy experience that I had feared it might be. The money that we brought into the village, both by means of our offerings as well as whatever they got paid by the tour operator, would go towards making their lives better in a positive and very tangible way. ￼The money we spent at staying at the Outrigger would go indirectly to the locals, by means of employment for local Fijians, but this experience cut out much of the middleman and demonstrated a more immediate effect and that felt really good to me. After a final blessing by our hosts, we made our way outside and down the hill again to the barbed wire fence marking the village boundary. We then made our way outside and along the dirt track back to where the boat was waiting to collect us again at the bottom of the embankment. As we were all making our way down the embankment towards the boat, several small children were having what looked like the best of fun dressed in nothing more than their underwear and completely soaked head to tow in mud and sliding down an embankment wall and into the river. They had made a make-shift water slide and were running up and down this mud slide having an absolute ball. Several of us remarked how we would have also liked to have joined in. Now loaded onto our boats and with our life-jackets on, we waved a fond farewell to our Fijian host, and the very muddy but extremely contented kids, as the boat sped finally away and around the bend in the river out of sight. On the ride back, Captain Hijack declared that we should all be prepared to get wet, as he was going to put the boat through it’s paces by performing some heart-stopping 360 degree spins. We passed a number of friendly, waving Fijians along the way before he commenced with a series of spins at certain points in the river. Everyone loved them and it was a genuine thrill. After the first spin, he stood up and motioned as if he was counting the number of people that were still in the boat, which earned him a raucous roar of laughter from everyone in the boat. On one spin, Sandy lost her grip on Jennifer and she went flying under the bench in front of her. Jennifer seemed to be unfazed by it all but I don’t think Sandy was impressed. ￼After a half dozen or so spins, we finally moored and everyone disembarked. We had just enough time for a bathroom break and for a few of us that were sitting on the outside of the boat to slip into something a little let dripping wet. The bus trip back to the Outrigger was bumpy but otherwise uneventful. The ‘Bula man’ bellowed his signature Buuuulaaaaaaa as our bus pulled up into the covered reception drop-off area of the Outrigger. As we wandered into reception, someone greeted me holding Joey’s wet shoes that I had left with them at the last minute prior to our departure. It was by now 18:00 and so I asked at the front desk for them to call through to the Sundowners restaurant to push our booking out another hour to allow us time to get showered and changed. This they did and all was well. So, we checked into the restaurant and were directed to our table, where for the next 45 minutes or so, we had the most delicious meal in a tranquil and serene environment, with live, gentle, Fijian style music emanating from the lone musician sitting on a stool just a couple of tables away. The weather had by now taken a turn for the worse and not only started raining sideways but with some stiff winds too. If anything, however, this only enhanced our meal and accentuated the warm and comfortable surroundings in which we sat. Sandy enjoyed her deliciously juicy eye-fillet stake as she had done the other day. This was initially going to be my choice also until I saw the the biggest slab of juicy pork ribs I’d ever seen sitting on the serving counter waiting to be taken to someone’s table. I confess to making a swift change of menu choice as soon as I saw it. We enjoyed our meal, including a rather indulgent desert, immensely and really felt happy and satiated. Just as I was thinking that things couldn’t get any better, and the bill had been settled, the staff (including the manager) and musician started to gather around our table and serenaded us with the Isa Lei (the goodbye song). Simply divine. During the middle verse, they sung very quietly whilst one of the staff stepped forward to explain that the Isa Lei was a love song like no other and was being sung especially for us to express love and friendship and to wish us a find farewell. He then stepped back again and the volume increased again for the final verse, which concluded with everyone one waving in unison their goodbye to us. ￼Now, I don’t consider myself an overly sentimental person at the best of times but I was simply unable to hold back the emotion and the tears came flooding. There are fewer pleasures in life than for you and your sole mate to be serenaded a most beautiful love song after a fantastic meal at the tail end of a most wonderful holiday. Once again, the staff at the Outrigger had exceeded my expectations and performed above and beyond the call of duty to make our stay here so very special. We staggered back to the kids club (it was a lot of food) and the kids were hopping up and down with enthusiasm for our earlier promise to let their friend, Jake, come over to our bure for a brief playdate. We met up with Jake and his parents at the kids club and all agreed that this would be a nice idea as a treat for the kids even though it was already very late, and so that’s exactly what we did. It was a relaxing half hour chatting with Jake’s parents but the hour was very late and they made their way back to their hotel room. Since our kids hadn’t actually eaten yet, we ordered their favourite meals through room service. ￼It arrived within 5-10 minutes or so and the kids finally managed to come down from the day’s excitement before settling down to sleep. Sandy spent the next hour or so packing for tomorrow’s departure. It promises to be a sad one and this is testament to just how much we’ve enjoyed ourselves here over the past week. I did my best to write up the day’s events but with so much information to get down, there was no way I was going to finish it off before falling asleep at the keyboard so I handed the laptop over to Sandy and let her have fun sifting through the day’s photography takings before laying back and peacefully nodding off into a blissful state of unconsciousness.